My Great Grandmother was a nun. After giving birth to 14 children and her husband dying, the Catholic Archbishop granted my GGrandmother special permission to become a nun in the cloistered order of the Sisters of the Precious Blood in Gravelbourg, Saskatchewan. It sounds crazy but it happened. My GGrandmother was a nun. I knew her well. As a child, I often went to the Precious Blood to purchase sheets of hosts, sheets from which hosts are cut for communion. My friends and I loved the taste of this flat bread. The only way I ever saw my GGrandmother was through grilled barriers, somewhat like a latticed fence. The monastery was cloistered. It was she who introduced me to the idea that we were Metis. Her smooth, round fingers would reach through the lattice, touch my cheeks and she would say, "Mon beau petit Metis!" "My sweet Metis boy!" My GGrandmother's mother was Jeanne Beaudoin, nee Charbonneau. She was buried in Kranzburg, South Dakota. 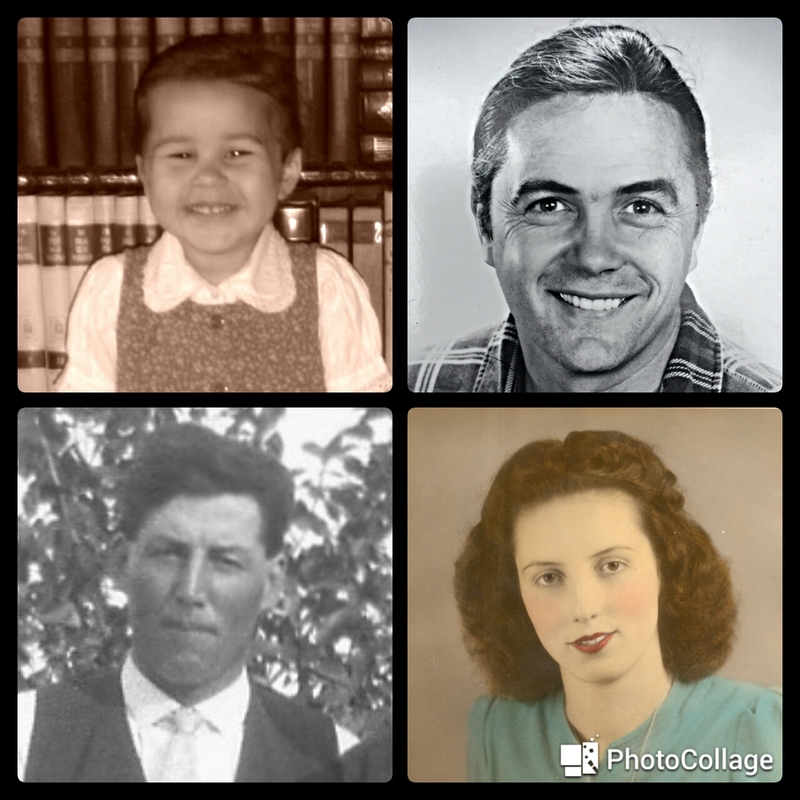 Her parents were Pierre Charbonneau, Ojibway and Josette Bonneterre, Osage. Of this there is no question. We have every document necessary that show where they lived, where they were married and where they died. I know their names. I know their Nations. I am of them. 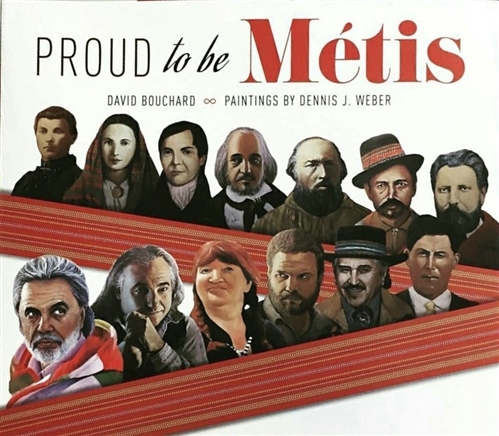 I am Metis. And be clear in this; I didn't seek them out for personal gain or for membership in a Metis organization. I simply wanted to know. And when I came to know, my life changed. I knew Odille Allard but I didn't know her mother or her Grandmother. The voyage I took in getting to know them was amazing! Expensive but worth it. Years to achieve but worth it. My voyage went like this. Twenty years ago, I went to our local Metis Nation of Greater Victoria. There, I was introduced to Stan Hulme, a wonderful man and the volunteer genealogist who helped the MNGV. Stan did some research for me and came up with what he thought would qualify me for citizenship in the British Columbia Metis Nation. It didn't. We added to his research but that didn't suffice either. The BCMN needed more. 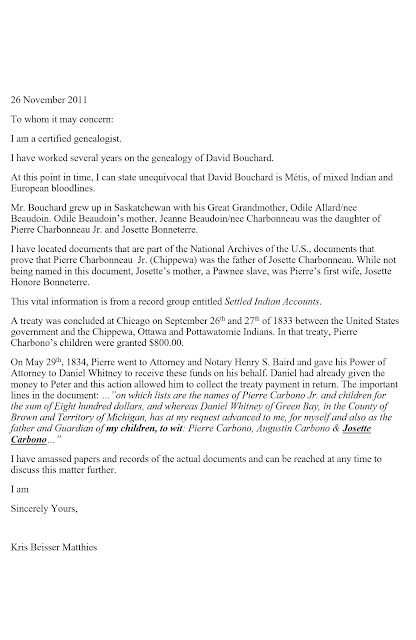 I learned that citizenship requires direct, legal documents for every link leading to Native ancestors. The first thing I did was to put the name of my GGrandmother, Odille Allard out on the internet asking if anyone knew her. I received a reply from Don Presser Jr., an accountant in Alaska. Don was her great nephew. 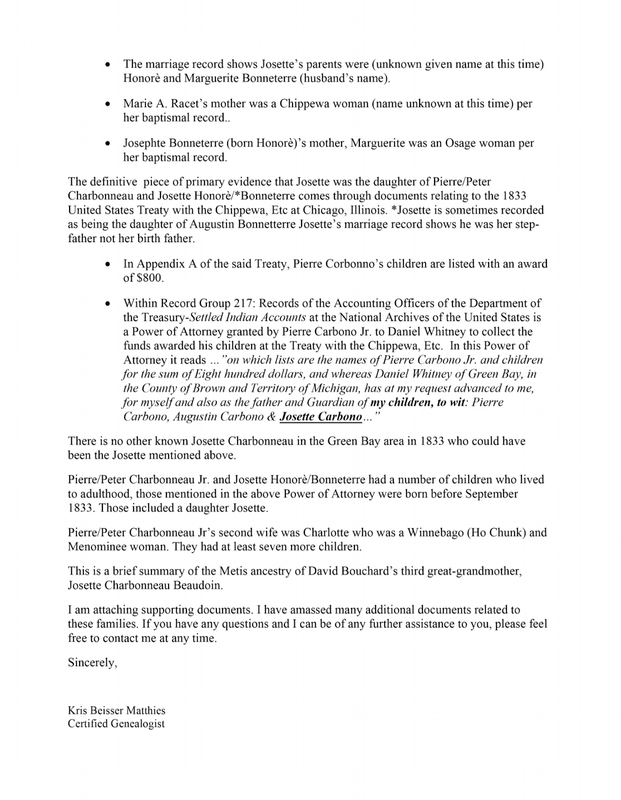 Don kindly sent me a document showing that our mutual ancestor was an Algonquin woman who twice appears on the Quebec census as Marie Louise Manitookookoo (Sauvage), He also suggested that I contact a professional genealogist in Green Bay, Wisconsin. I did exactly that and Kris Matthies began what was to become years of research. Kris found legal documents for every person in my ancestry. The process was time consuming and costly as the time it takes to find death/birth/marriage/baptismal certificates is substantial. Churches burn. Government offices close. Costly. After seven years, Kris had everything needed to show my lines back five generations. I knew the details of three generations back but I now had five. My GGrandmother was Metis. By today's laws, she could have been a status First Nations woman but back then, they didn't care to count themselves either FN or Metis. 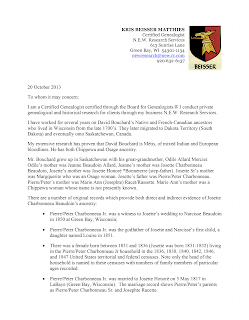 Her mother, Jeanne Beaudoin, nee Charbonneau, was proven to be the daughter of Ojibway Pierre Charbonneau and Osage Josette Bonneterre. In today’s ruling on status, Jeanne Beaudoin would not have been Metis, having two First Nation parents, she would have been a First Nations woman. It should be noted that back then, Metis people did not want First Nation status, in fact they tried to conceal their bloodline and they worked to fit into mainstream society. The ramifications of the North West Resistance and the open racism toward Indigenous people had those who could, hide. My GGrandfather Narcisse Beaudoin's tombstone reads Nelson Bowdwine. He changed his name to try to sound/look English and thus white. He likely couldn't even pronounce the name. The next and final stage of my voyage was to ask Kris to plot out a trip that Vicki, Victoria and I would make, a trip to the homelands of these amazing people. We flew to Winnipeg, rented a car and drove to Kranzburg, South Dakota. There, we found the resting place of my GGGrandmother, Jeanne Beaudoin/nee Charbonneau. Victoria and I offered tobacco and played our honour song for her. We then drove across the Northern US, the same trip that our ancestors made, back to Bay Settlement in Wisconsin. As Kris predicted, we were unable to find Pierre Charbonneau or Josette Bonneterre's resting places but we did find the church in which they were married. And of course, we visited the towns and churches that Kris suggested we visit, that included the church where Odille was married. Can you imagine the pleasure that brought to me? 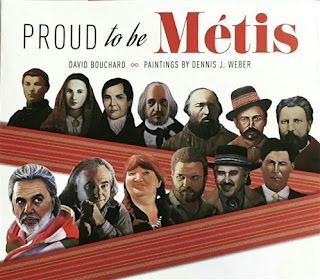 I am French, Ojibway and Osage and I am Proud to be Metis. I could obviously go on and on as I love speaking of them. 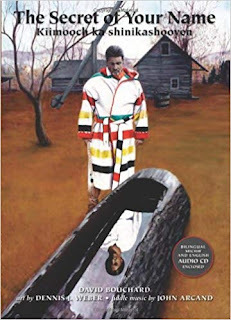 Yes, I have written two books to honour them, The Secret of Your Name and Proud to be Metis. Finally, allow me to share a couple pieces that speak to my journey and the pride I have in my ancestors and in my being Metis. We don't normally reply [or give credence] to someone who hides their name in anonymity. 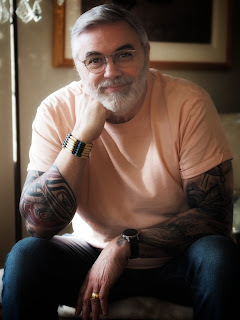 However, because you have attacked an icon who is highly respected across Canada by many Metis people and who is also recognized nationally and internationally for what he does both for Metis and other Indigenous Peoples we are making an exception. We could take issue with many of your points, but will give you our abbreviated views. First of all, we should tell you George's Red River Metis ancestry goes back over two hundred years, and there is no one whose Red River Metis ancestry exceeds his [although some may equal it]. You are likely unaware of David Bouchard's sterling background. He has been honoured at the highest levels [in Canada]. A few examples are: he is a recipient of the Order of Canada, a Governor General's Award, and an Honourary Doctorate from a prominent Canadian University for his achievements etc. [What Metis politician today can match that]. As for Metis status, your comments are all based on the so-called Metis Homeland essentially the Prairie Provinces]. The Historic Metis Homeland concept is a restrictive, relatively recent, concept ill-defined by a few dozen Metis politicians in 2002. [Before that, the Metis National Council (MNC) draft was even more restrictive]. Their restrictive definition is, of course, the right of the MNC and its five provincial affiliates, since they can determine who can become their members for their own organizations. But, it does not give them the right to say their members are the only Metis in Canada and no one else is Metis. [We know a number of so-called Homeland Metis who simply do not want to be involved with the MNC. These include Ernie Blais, the founder of the Indigenous Peoples Association of Manitoba, and we believe one of its members Yvon Dumont, former Lt. Gov. of Manitoba. Both Blais and Dumont are past presidents of the Manitoba Metis Federation, an MNC affiliate]. 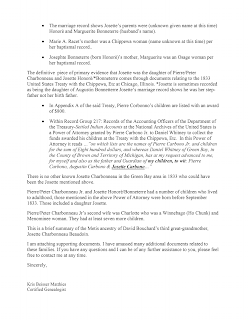 Perhaps you are not aware of the landmark unanimous decisions concerning Metis made by the Supreme Court of Canada (SCC) in the 2003 Powley case and in the 2016 Daniels case. Powley dealt with s. 35 of Canada's 1982 Constitution, and Daniels dealt with s. 91(24) of the 1867 Constitution. In the 2003 case, the Powleys (father and son) were accepted as Metis by the SCC. They and their Metis ancestry were from Sault Ste. Marie, hundreds of kilometers to the east of the arbitrary designated map of the Homeland arbitrarily adopted by the MNC in 2018. Notwithstanding this, the MNC intervened on appeal of Powley who were not Metis within their ill-defined definition or arbitrary map. These two cases should be read by you in detail. Nowhere, nowhere is there any mention in either of an Historic Metis Homeland. We could carry on with many more pages. However we are not doing so, and we will have no further comments to add or reply to any.